Carefree Farms is a full care training facility. Effective May 1, 2018 for all new boarders and horses. **Participation in a Training and or Lesson program with one of our trainers is required when boarding at Carefree Farms. 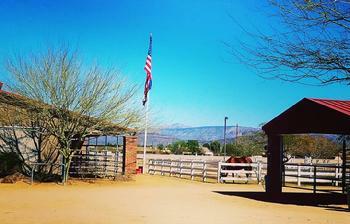 Please visit our trainer's website: Desert Sport Horse for more information and for Training and Lesson fee schedule. ** 1 or more lessons/rides per week is required while boarding at CFF - Special circumstances may apply. New clients only- Introductory offer! $15/each for 1st 3 haul-in sessions then regular fees apply as above of or sign up for membership program (recommended). Must be accompanied by approved trainer and in a lesson. No jumping in show jumping arena unless authorized. USEA/USEF Safety apparel required when schooling. Stabling is limited - Advanced notice required please! These rates are in addition to any other haul in fees! Unlimited haul-in access for one month - must be in a lesson program with CFF trainer. Unlimited use of riding arenas. Scheduled use for galloping and conditioning on track or XC - we need to ensure someone is on site while galloping. Members enrolled for 3 consecutive months will receive CFF Discounts at our Facility Events! Helmets are ALWAYS required while mounted and riding. Sign in at the office when you arrive at the facility. NO jumping anytime unless you are in a lesson. No jumping in the show jumping arena unless authorized. Lunging in designated areas only - check with manager upon arrival. Clean up after your horse(s) in the trailer parking area. No turnouts are available for non-boarders. Assume responsibility of any damage as a result of you/your horse. Sign in at office each visit. Complete and sign Membership Agreement, Rules and Regs and Liability form Annually. Monthly fee to be paid in full by the 5th of every month; if payment is late - the rider will be dropped from the program. CFF Membership Agreement ~ Click here!!!! Please contact us to inquire about what is available and to set up a tour. Ask us about our move in Special for new clients!!! Please download all of our forms for your review. After reviewing please fill out and return to our office. Thanks again for you interest. Carefree Farms requires that we have the Release and Waiver of Liability Form updated annually.